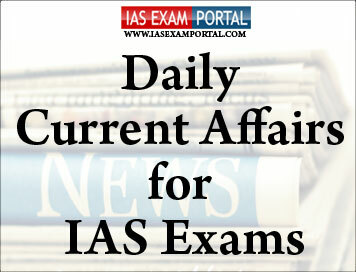 Current Affairs for IAS Exams - 21 JANUARY 2019 | IAS EXAM PORTAL - India's Largest Community for UPSC Exam Aspirants. The 15th edition of PravasiBhartiya Divas begins at Varanasi in Uttar Pradesh today. Around 6,000 NRIs are expected to take part in the three-day event which is being organised in Varanasi for the first time. The theme this year is, 'Role of Indian Diaspora in building New India'. Several world leaders of Indian origin, including Prime Minister of Mauritius, Pravind Kumar Jugnauth, will take part in the event and share their insights on the theme. Prime Minister NarendraModi will formally inaugurate the event tomorrow, with Mr Jugnauth being the Chief Guest. The valedictory address and PravasiBharatiyaSamman Awards will be given by President Ram NathKovind on Wednesday. Youth PravasiBhartiya Divas and Uttar Pradesh PravasiBhartiya Divas will be held on the opening day today. Information and Broadcasting Minister RajyavardhanRathore yesterday inaugurated several exhibitions including a digital exhibition on the theme of 'Ek Bharat Swacch Bharat: Sardar Patel and Gandhi keSapnoka Bharat. In a discovery that has pushed back the hoary past of the historic Kondaveedu fort to 3rd century AD, a Buddhist circular stupa and pillared pavilion (silamandapa) datable to the Ikshvaku times, have been unearthed at the fort. The Kondaveedu fort was a well-fortified city and was the capital during the reign of Reddy kings and later used by the French and the British as a garrison.A freelance archeologistKadiyalaVenkateswaraRao had earlier unearthed marble stones at the same site indicating the Buddhist links. Mr.Sivanagi Reddy said that the stupa structure which was 4.5 ft tall with a diameter of 12.5 ft consisted of 10 layers of well-dressed Palnadu limestone, which the Buddhists preferred. The bottom layer was carved with a lotus flower design representing the mature phase of typical Amaravathi School of Art as seen at the pedestal of the world famous Nagarjunakonda Buddha image, thus giving clue to conclude that the stupa was built during the Ikshvaku period. It is also learnt that a beautiful sculptural panel depicting animals and floral motifs in Ikshvaku idiom was also recovered from the foundations of the stupa, along with a Brahmi label inscription (not legible ) which is now in the possession of the Department of Archaeology and Museums. Interestingly, the team, while inspecting the levelling work going on at the parking area in the site, stumbled upon a beautiful limestone pillar carved with a half lotus medallion flanked by a bunch of flowers in the Ikshvaku art style. National Solar Energy Federation of India (NSEFI), a non-profit organisation, has written to the Prime Minister’s Office requesting to direct the Reserve Bank of India (RBI) to rationalise the new ECB framework suitably, excluding repayment of rupee loans from the negative list. The NSEFI apprises that till date, RBI has allowed the external borrowing in the form of security bond/loan in U.S. dollars to replace the Indian rupee loans having tenure of 10 years or more given by domestic banks/financing institutions. As per this notification, erstwhile tracks I and II are merged as ‘foreign currency denominated ECB’ and track III and rupee denominated bonds framework are combined as ‘rupee denominated ECB’ to replace the current four-tiered structure. However, the existing permissible end use of repayment /refinancing of rupee loan availed under track-II of ECB has not been considered in the merged foreign currency ECB framework in any form, NSEFI chairman Pranav Mehta wrote. Payment of GST for interstate stock transfer which is treated as a sale, resulting in IGST liability, was made available as full credit in the destination location. This has resulted in tax savings to the manufacturer. Additionally, all tax on interstate purchase was not available as input credit under VAT regime whereas now it is available. For capital equipment manufacturers, warranty issues are invariably a commitment given to customers across all industries. Warranty supplies are usually committed under very limited deadlines since the equipment would have stopped working causing huge loss to the customer. Arab leaders and officials have urged the international community to support nations hosting Syrian refugees and take steps to minimise the impact of the refugee crisis. The call was made in the Beirut Declaration at the Arab Economic and Social Development Summit that concluded in the Lebanese capital yesterday. At a press conference after the summit, Lebanese caretaker Foreign Minister GebranBassil said, this is the first time Arab countries have reached a consensus on encouraging Syrian refugees to return to their country. Deciphering how the fruit fly brain works has been a significant branch of study in the biological sciences for several decades now. In this, a team of researchers from National Centre for Biological Sciences, Tata Institute for Fundamental Research, Bengaluru (NCBS-TIFR), have figured out the neuronal circuitry that is involved in processing bitter taste. While the neurons that sense the bitter taste have been identified, as have the motor neurons that innervate the physical reactions to having sensed bitter taste, the intermediate circuitry has remained unknown. Partly the reason for the interest in the workings of the Drosophila (fruit fly) brain is because it is a good proxy to approach the goal of knowing how the human brain itself works. The reactions of fruit fly to bitter and sweet tasting material differ significantly. When it senses food cues, mainly sweet tasting, through the sensory neurons in its legs, or proboscis, it extends its proboscis for consuming the food. This will help understand the role of different neurons and molecules (present in the brain) in sensory information processing and behaviour. India's AnkitaRaina has won the International Tennis Federation's 25,000-dollar Women's tournament in Singapore. In the Final yesterday, Ankita defeated top seed and world number 122 ArantxaRus of the Netherlands, 6-3, 6-2. She toppled four seeded players in the tournament to win her first title of the season and eighth overall. Ankita came into the tournament after competing at the Qualifiers of the ongoing Australian Open. She will play two more tournaments before gearing up for the Fed Cup, starting in the first week of next month at Astana, Kazakhstan.